We just a took a fantastic trip to Sequoia National Park in California! Can I say AMAZING!! We had so much fun and were amazed at all we saw. 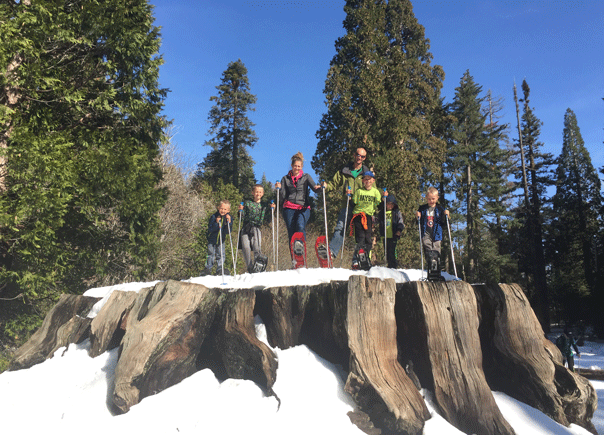 This post is going to focus on information that will help you understand the layout of the Sequoias, what hikes are good for kids, what time of year is best for you to go, what to pack and more. We decided to go to the Sequoias over our spring break which was the last week in March. We drove from Utah in our motorhome and reserved our camping spots near the closest RV park to the park entrance which was Three Rivers Hideaway. It was a great spot. 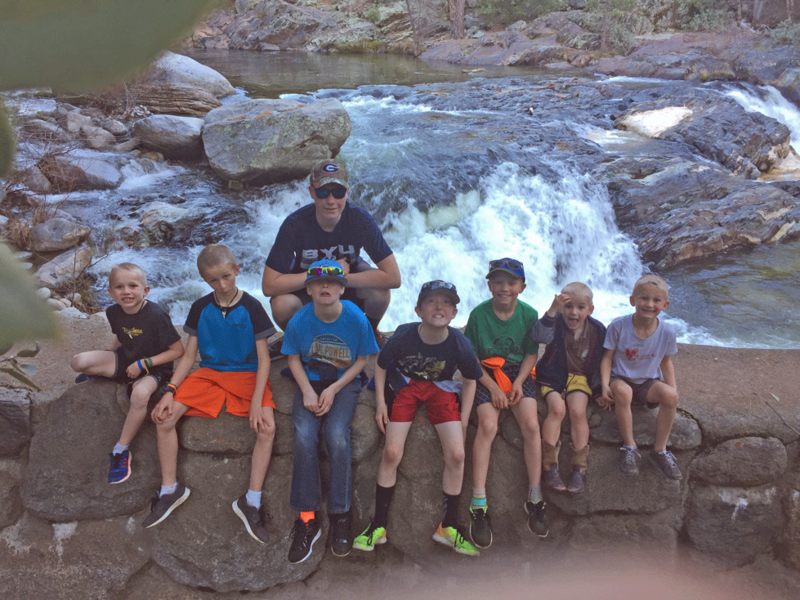 All of the hikes I am mentioning we did with 8 boys ranging from 3 to 16 years old. We also had Grandma come with us who had a nifty cane that has a chair on it. When she got tired she stopped and sat on her cane that turns into a chair to wait for us to return. Some hikes she just returned to the car and didn’t make the full loop. One thing you need to understand about Sequoia National Park is that there are 2 entrances to the park. One side enters at Three Rivers and is the Sequoia National Park Entrance or the Ash Mountain Entrance. 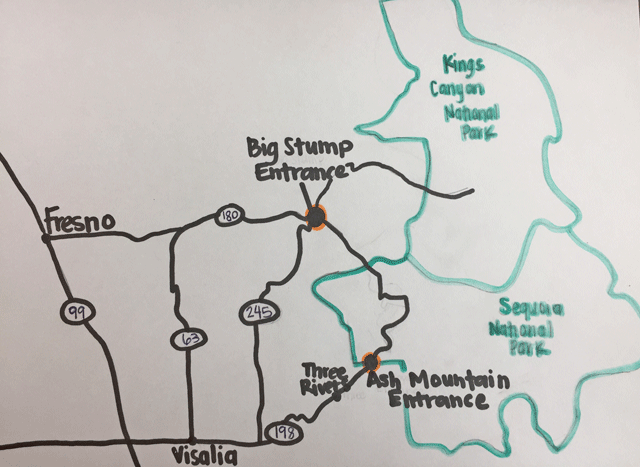 The other entrance is close to Fresno California and is the Kings Canyon National Park entrance or the Big Stump Entrance. Coming from Utah, Three Rivers is closer so we decided to choose the Sequoia National Park entrance. Above is a map I drew to show you the routes you can take. From one entrance to the other WITHIN (far right) the park it took us about an 2-2.5 hour drive to get from one end to the other. It is a huge climb in elevation and has tons of switchbacks. It really depends on what kind of driver you are. If you take the 245 (middle right) it will take you 1.5 hours to get from one side to the other and the 63 (middle left) is about 15-20 minutes longer. The main attractions on the Sequoia National Park side are about 40-60 minutes up the canyon. General Sherman is about an hour up the mountain on the SNP side. 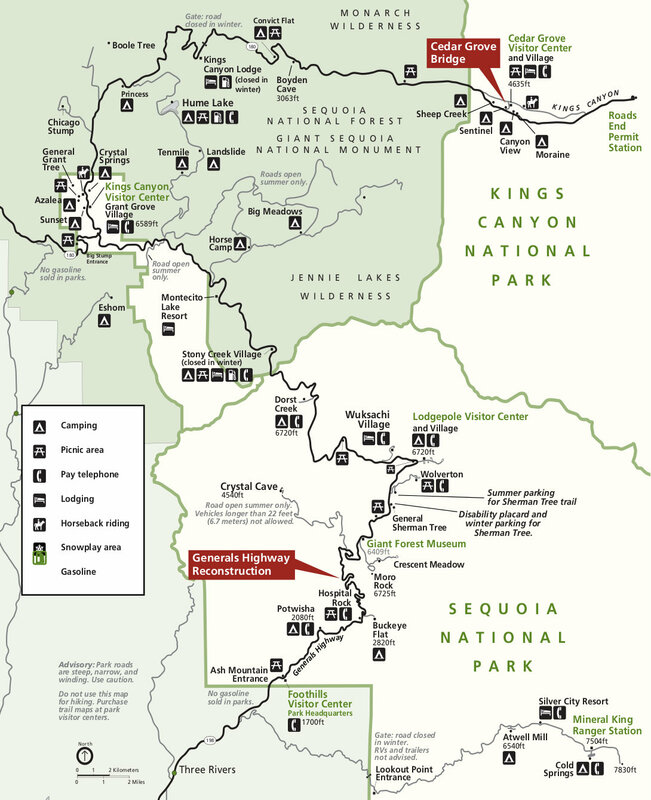 On the Kings Canyon Entrance the main attractions are within 10-20 minutes. Both sides are a must see if you have the time! As I share with you my ideas and tidbits of information, I will mention which side of the park it is on to help you in your planning. We spent 1 day on either side. There is a lot of driving in your day as well. First here is a little history of the Park that is interesting. 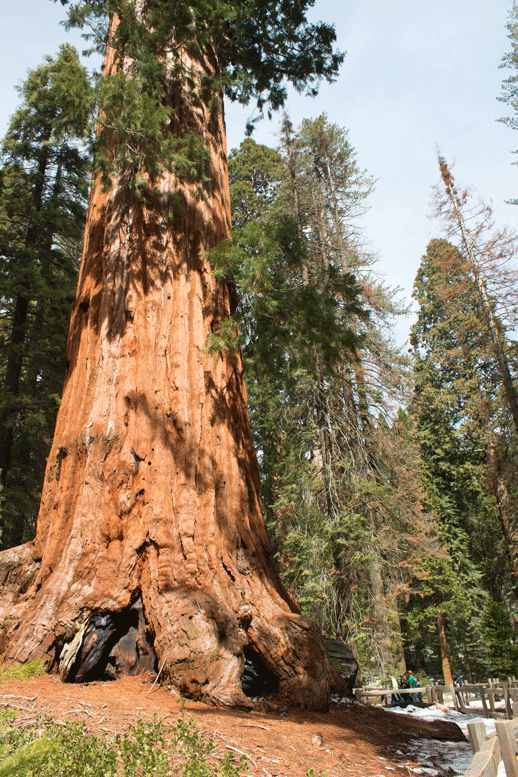 Back then the Sequoia National Park was protected by the US Calvary which is why so many trees are named by different generals and individuals. General Sherman is the largest living organism in the world. It is pretty impressive! There is more firewood in this tree than any other tree in the world! 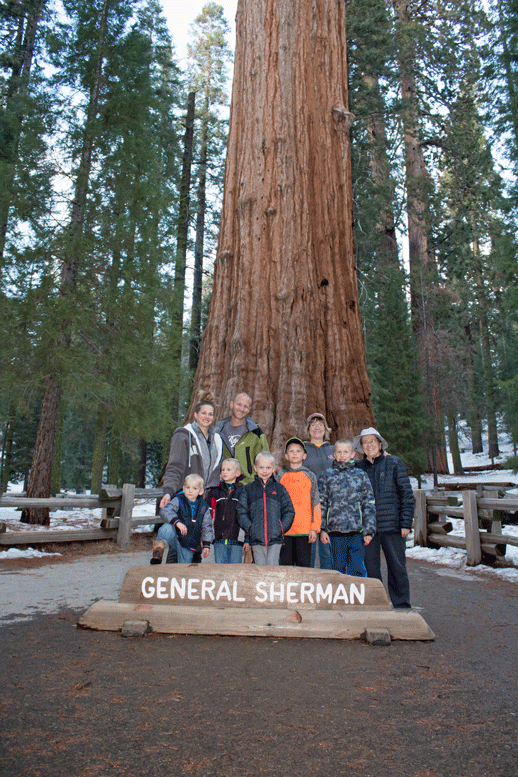 General Grant is the 3rd largest tree and is taller than General Sherman. Some of these trees are more than 3,000 years old!! WHAT?? Here is a map to help you visualize where these hikes are. Hospital rock is a huge rock that is named when a man was setting a trap for bears and a gun went off and injured him. They nurtured him back to health by this rock. There are old paintings on the rock as well. Close by there is a flat rock that has bowl like shapes on the top. This was used to ground up acorn nuts for flour. This trail leads you to the river with some beautiful views. You start this trail by Hospital Rock. You walk up the road to the right of Hospital rock about a half mile and it will lead you to a campground with the trail head We stopped at the Middle Fork bridge about 0.8 of a mile in. It was beautiful and a great hike. If you go past the bridge you will find a waterfall and swimming hold. Get this book for more details regarding this hike. Very short and easy with a paved walkway. 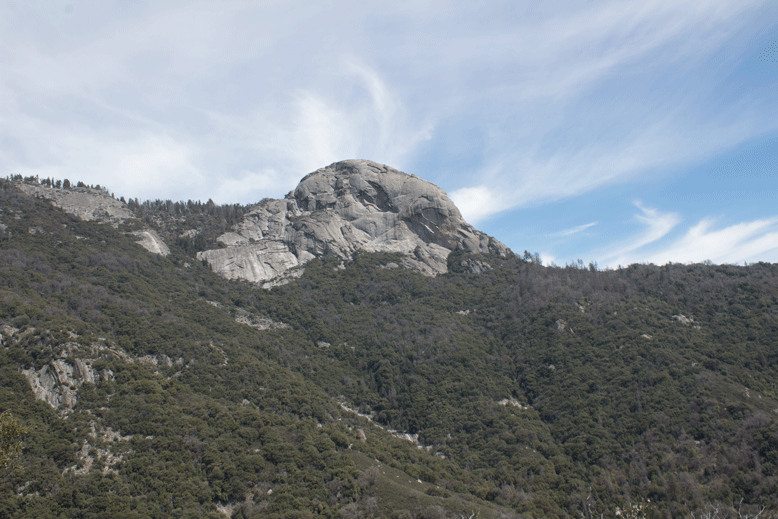 There is a trail called the Congress Trail that breaks off of the General Sherman Loop. There was still snow on the ground so we didn’t take this trail but during the summer it is a fairly easy trail. During the summer this is a very easy hike. 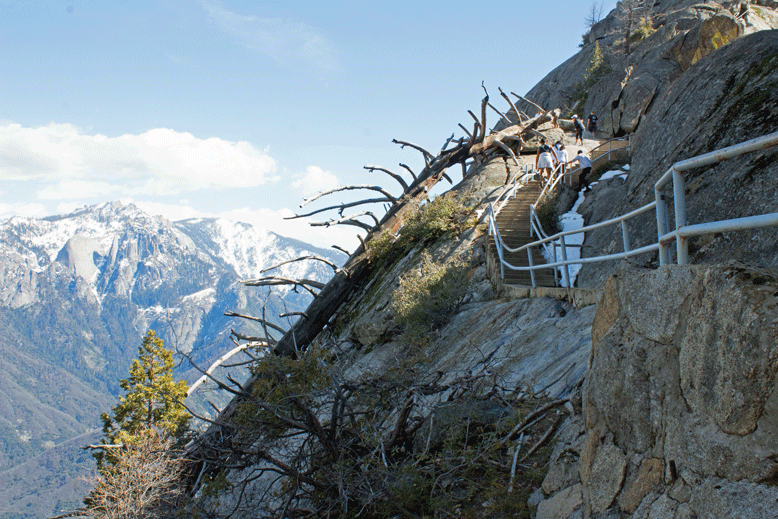 It is just under a mile total of climbing stairs IF THE ROAD TO MORO ROCK IS OPEN. The road was not open so we had to hike an additional 1.5 miles just to the base of Moro Rock. It was snowy and slushy and our 5 boys made it! Their feet were wet and wrinkly by the end of the day but they did it and it was awesome! The view is incredible. Side note: If you are driving up the Sequoia National Park side there will be a look out with a rock wall as your going up the switchbacks. If you look up the mountain, you will see a huge rock above you. That rock is Moro Rock. It is fun to see it at this perspective. This is also an attraction you can drive right up to in the summer, but in March you will have to hike to it. The trail branches off from the Moro Rock Trail to the Tunnel Log. It is only about a 10 minute hike when it branches off. You can actually drive through this with your car. It is a loop you can take over and over again! Easy and takes about 30 minutes. This hike is really cool and has a lot in it. It had a fallen sequoia that is hallow that you can walk through. This hallow tree has been used as a hotel, stable and other shelters for many years! There is also an old log cabin that has been used for various reasons. Add all of the other giants there and you have a fascinating hike! Note the tiny people at the bottom of this tree! This trail was snow packed, muddy in some areas and slushy in lots of places. Many of the trails on this end of the park were snow covered and the only way to get around was on snow shoes! So what do we do with 5 boys and Grandma with us?? We rent snow shoes and we go on the Big Stump trail!! IT WAS SO AWESOME! This was probably my favorite part! The air is very warm in March, we only had on light jackets The first part of this trail goes down hill on switch backs. You see lots of stumps along the way which give you a different perspective of these massive sequoias. There are a couple options you can take with this trail. You can just hike to the Mark Twain Stump which is really big and turn around and head back! OR you can keep going on the loop which is awesome and beautiful, especially in the snow on snowshoes! On the other side of the trail is a tree called the sawed tree. They started to cut this tree down, but quickly learned it was not going to fall in the direction they needed it too. Because of this they stopped cutting this massive tree down. It is now still healing. The entire loop is close to 2 miles and isn’t a flat hike. It goes up and down and over little streams! It was awesome with snow everywhere! I can only imagine the hike being absolutely beautiful during the summer! My boys did great on this trail. There is a trail all the way around this lake that is beautiful. This is a 30 minute drive from the King Canyon Entrance. FROM MAY – SEPTEMBER there are 2 crystal caves that are open. There is one on each side of the entrances. They have stalactites and stalagmites everywhere that looked amazing. This is one of the attractions we missed by going in March. They were doing construction on the Sequoia National Park side so they were NOT ALLOWING RV’S LONGER THAN 22 feet to enter the park. Check their website to learn of current road conditions within the park! . We didn’t check this before hand and we ended up having to rent cars to go up the canyon. They did allow bigger rigs to go up the King’s Canyon entrance it was just a longer drive, and we weren’t sure how it all was set up. A car was much easier to move around in, there is not a lot of parking spaces up the canyon. Here are 11 tips and tricks to make sure your trip is amazing!! Some of these we had to learn the hard way! There are NO gas stations within the park. Prepare for that before you enter the canyon! Pack lots of water. This of course is a must! The road is very windy with lots of switchbacks. If you have kids who get car sick, be prepared with some remedies to help with motion sickness. The road is much windier on the Sequoia National Park side vs the Kings Canyon side. Bring a light jacket, heavy jacket and rain parka. The weather is different in different areas of the park. The Sequoias range from 1,370 to 14,505 feet in elevation! That is a huge difference people! We reached 7,500 feet in elevation, so just be prepared for all kinds of weather. Prepare to pack a lunch, and lots of snacks to keep your kids fueled all day! I also brought another loaf of bread with PB&J just in case! We entered the park in the morning and left at dark! There are some restaurants on the Kings Canyon side but there isn’t much more. Flashlights just in case you don’t get back before dark. If you are going in the Spring or Fall, get waterproof shoes or plan on bringing lots of extra socks. 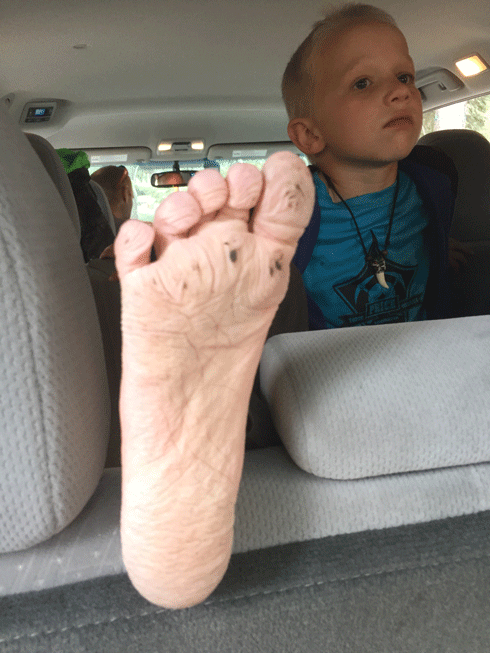 My son had cowboy boots on during the hike. 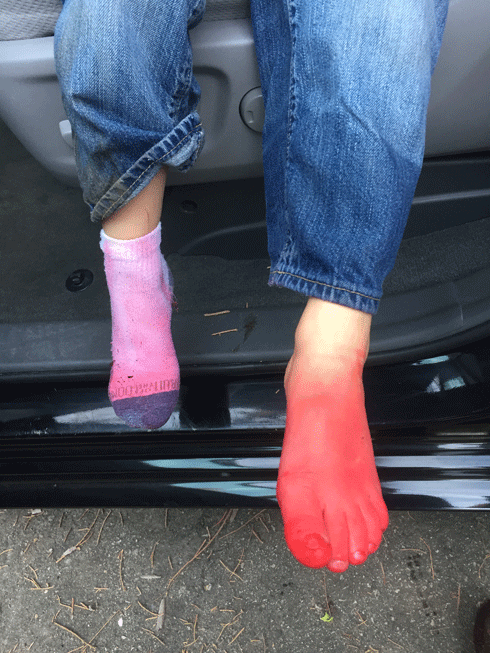 When we took his boots off, we found his feet were dyed pink! It was hilarious, however my little boy didn’t thing it was very funny! 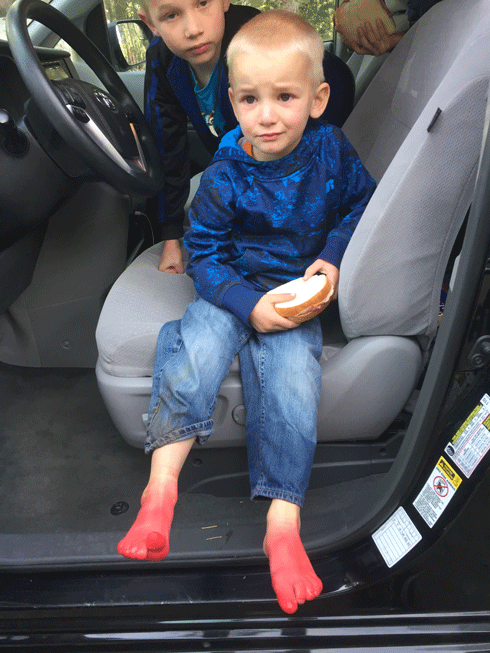 Point of the story is that your feet may get wet…especially your kids who don’t pay attention to where they are walking. Plan on bringing hats and sunglasses too! Spray everyone with bug spray that prevents mosquitos AND tick bites. There are ticks up in the Sequoias and a small portion of them have Lymes Disease. 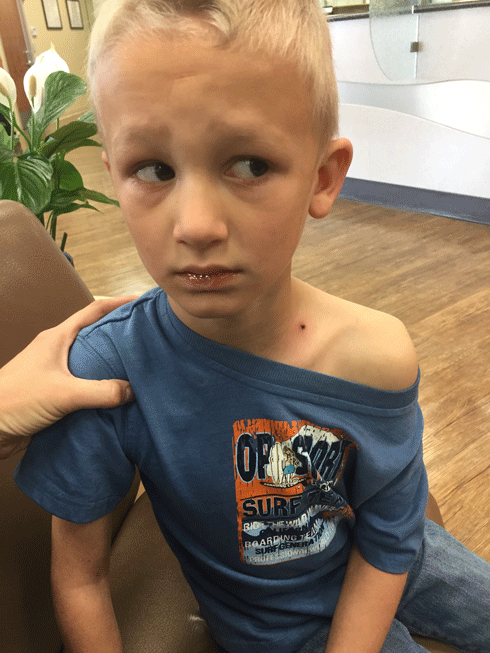 Our son woke up after the first day with a tick in his neck. It was so sad. You see that black mole on his neck. Yep that mole had legs! You can read here how to prevent, remove and treat tick bites. Darn bug! Here is some bug spray you can buy. I bought 2 books that we used often. They have history and details about each hike in them. Here is the big one with a lot of long hikes as well as short, and here is the day hike book. We used both a lot. I like the map better in the big one and the info about the day hikes in the little one. It shared interesting history as well. Head over to Tripadvisor.com to book your hotel, campground, or just to check out reviews on different hikes. I found the reviews there very informative. 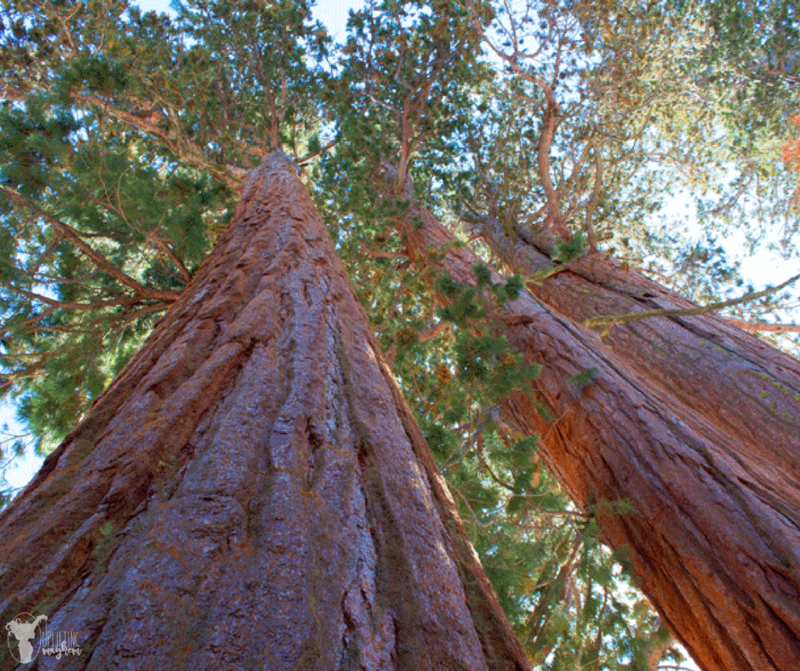 The Sequoia National Park is so amazing and worth every hour driving to see these amazing trees! We loved seeing all the snow and the beauty, but going in the summer I believe would be breathtaking (June-October). 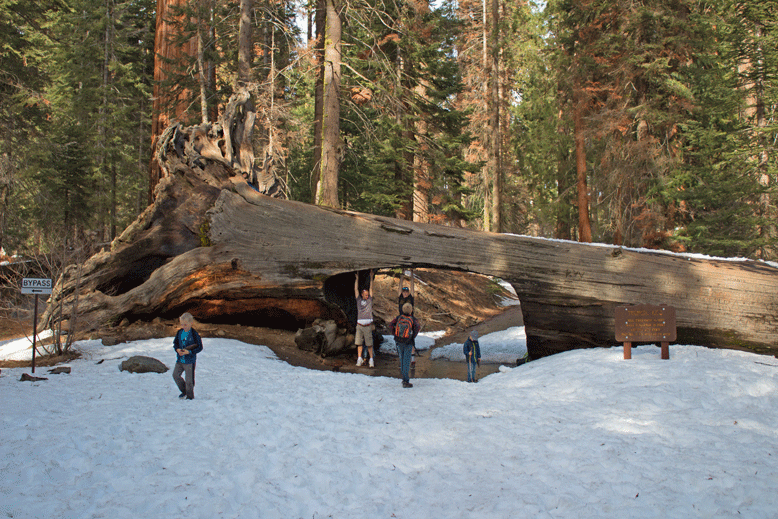 Entering the Sequoia National Park entrance, you will wonder where all the big trees are. Don’t worry! They are there and you will LOVE IT! Tips and Tricks for your NEXT CARNIVAL CRUISE!